Thirty years experience, thousands of medical and hospital flights completed successfully. Thousands of medical and hospital flights with NO loss of life and NO air mishaps - 100% success. When we fly a patient, hospital flight transportation is our only business - no charter or cargo. If you or your loved ones need reliable, safe, prompt, professional hospital flight transfer or you have questions, please phone us anytime. 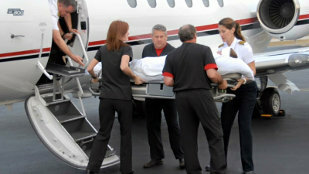 We will offer you the highest quality in the hospital flight industry.